South Korean actresses, Jung Yoo Mi (정유미) and Park Shin Hye (박신혜) attended the 49th Daejong Film Awards held at KBS Hall in Seoul, South Korea on October 30, 2012. Jung Yoo Mi (정유미) wore a burgundy dress with a leather bodice from The Izzat Collection Fall/Winter 2012 collection. Accessorizing her look with a white Couronne clutch, blazer with gold lapels and brown open-toe ankle booties. 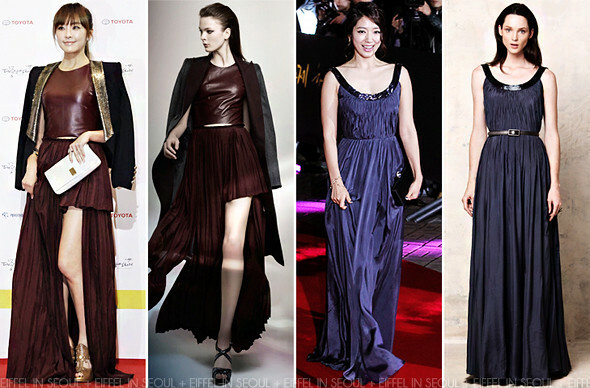 Park Shin Hye (박신혜) wore a navy 'Vestido' Adolfo Dominguez gown from Spring/Summer 2012 collection. A black clutch to complete her look.